An egg allergy is one of the most common food-related allergies among young children, but can affect anyone at any age, according to KidsHealth.org. If you've been diagnosed with an allergy to egg whites, you should avoid all products containing eggs. Even if you're not allergic to egg yolks, you should avoid eating them because of the risk of cross-contamination between the two parts of the egg. Any modification to your diet needs to be discussed with your doctor before implementing any change. If you're allergic to eggs, you may be allergic to the egg white, the yolk or both parts of the egg. During an egg allergy, your immune system fails to identify the proteins in the egg whites as safe, which triggers the body to produce certain antibodies that attempt to neutralize the proteins. The presence of these antibodies causes mast cells in soft tissue to release histamine, a naturally occurring chemical in the body, according to MayoClinic.com. Histamine and other chemicals cause inflammation in the body that lead to common egg allergy symptoms. MayoClinic.com states that the most effective way to prevent an allergic reaction to egg whites is by eliminating eggs from your diet. The Cleveland Clinic states that common foods that should be avoided are cakes, eggnog, breaded foods, cream-based foods, custard, doughnuts, egg noodles, frosting, ice cream, pudding, soufflés, waffles, tartar sauce and pretzels. Some ingredients to be aware of are albumin, globulin, livetin, ovomucin and phosvitin. 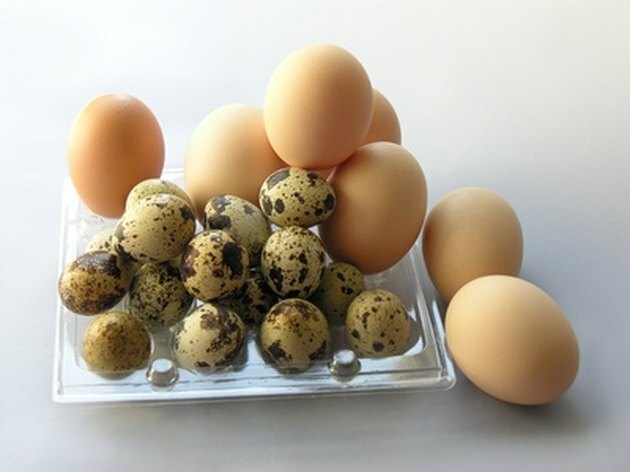 Eat foods that do not contain any egg byproducts. Eat plenty of fruits, vegetables and whole-grain foods. To ensure the foods you're eating are egg-free, purchase only products that state that they do not contain eggs, or you can make your own foods at home. Read the product labels closely and always ask about foods before ordering when you eat out. Eating foods that contain eggs puts you at risk of developing a severe allergic reaction, according to KidsHealth. Anaphylactic shock occurs when your body produces excessive amounts of histamine that causes your body to go into a state of shock. If you develop these symptoms, call 911: facial swelling, difficulty breathing, hives, lightheadedness and dizziness. A severe allergic reaction from eating eggs may require an injection of epinephrine to alleviate life-threatening symptoms.